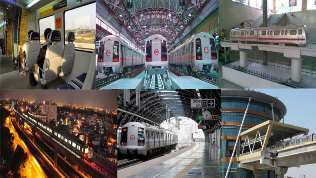 New Delhi: The Urban Development Ministry has shelled out Rs 7,637 crore towards metro rail projects in five states and the national capital in the current financial year till November, Lok Sabha was informed on Tuesday. Urban Development Minister M Venkaiah Naidu said during the Question Hour that various measures are being taken to improve public transport and parking spaces in various cities. In the current fiscal till November, the Ministry spent Rs 7,636.98 crore for metro rail projects in the national capital and five states — Tamil Nadu, Karnataka, Maharashtra, Kerala and Gujarat, he said. For Delhi, the expenditure stood at Rs 4,160.82 crore and for the project in Chennai, it touched Rs 1,773.59 crore, the Minister said. He said the Ministry’s expenses towards Bangalore project (Karnataka) stood at Rs 857.97 crore. For the metro rail projects in Kochi (Kerala) and Ahmedabad (Gujarat), the expenditure till November stood at Rs 599.08 crore and Rs 100 crore, respectively. In Maharashtra, there are metro rail projects in Mumbai and Nagpur. For Mumbai project, an expenditure of Rs 108.52 crore has been incurred by the Ministry till this November, while for the Nagpur project, the expense stood at Rs 37 crore during the same period. According to the Minister, metro rail projects are implemented in partnership with the states. To a query about the fourth phase of Delhi Metro Rail project, Naidu said the proposal is pending with the Delhi government.